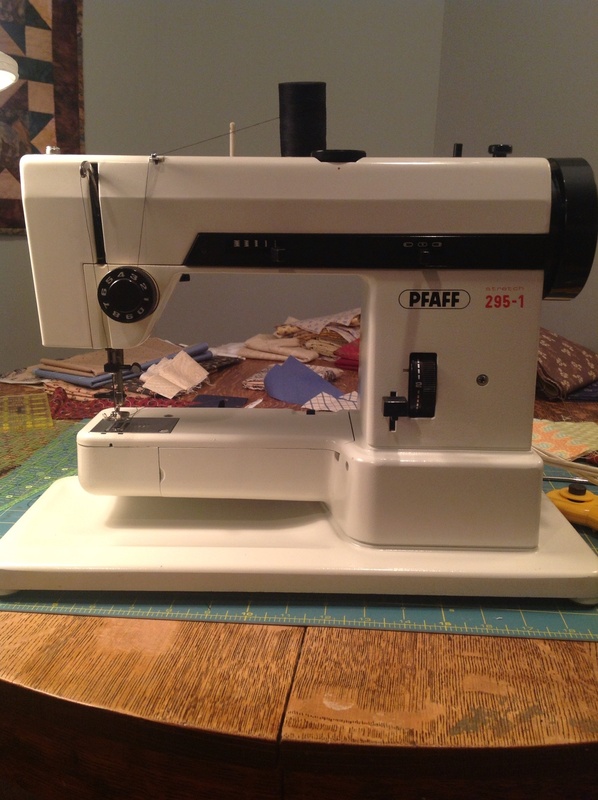 PFAFF 2056 – This is a computerized wonder which has not let me down. I had to finance this one and started out upgrading every three years in the 90s. It is from 2007 but I have no desire to have modern conveniences – needle up/down, threader, cutter, patchwork setting, FMQ, auto presser foot (my favorite feature). 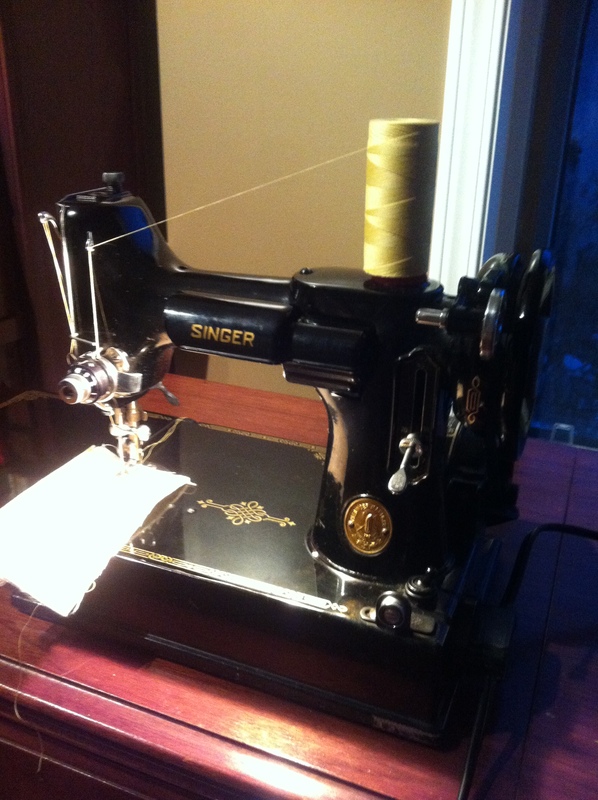 SINGER TREADLE – This one started my obsession. 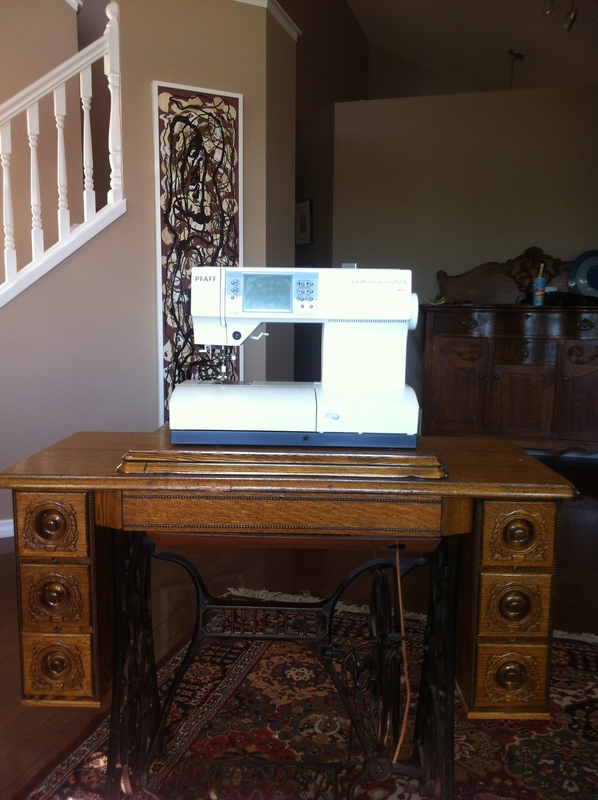 It all started when I was looking on my local craiglist for a sewing machine table. I was sick of the plastic bowed table that was vibrating as I quilted. I found this BEAUTIFUL cabinet that I thought would be perfect & sturdy. I had no intention on using the machine…and got it for $50. It is made in Elizabeth New Jersey, USA in 1910. Serial G5580946. Model 15-30 treadle. SINGER 15-90 ELECTRIC. After that I was hooked. I found this beauty with the traditional scrolled face plate for $20. A retired upholstery maker was getting rid of it. He sold it for cheap because he couldn’t get it to sew anymore. It sews like a dream now but that is a story for another day. She was made during 1938 in Brunswick Canada. Serial JB970671. Her cabinet is mint with a gorgeous patina. SINGER 201-3 ELECTRIC. No excuse for buying this other than it too was $20 with a cabinet. I was looking for a working machine and at the time the treadle and the 15-20 still didn’t run. 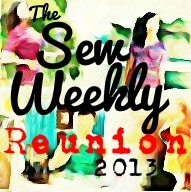 So when I emailed the seller, she said it sewed! This one purrs and later I find out it is a highend dressmaker model. Serial EG 913… Made in Kilowie Scotland in 1949. I wish sewing machines could talk! 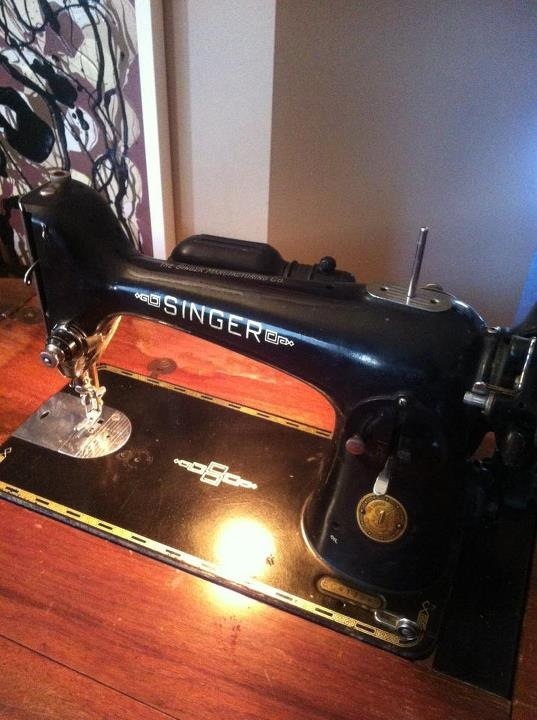 SINGER FEATHERWEIGHT! 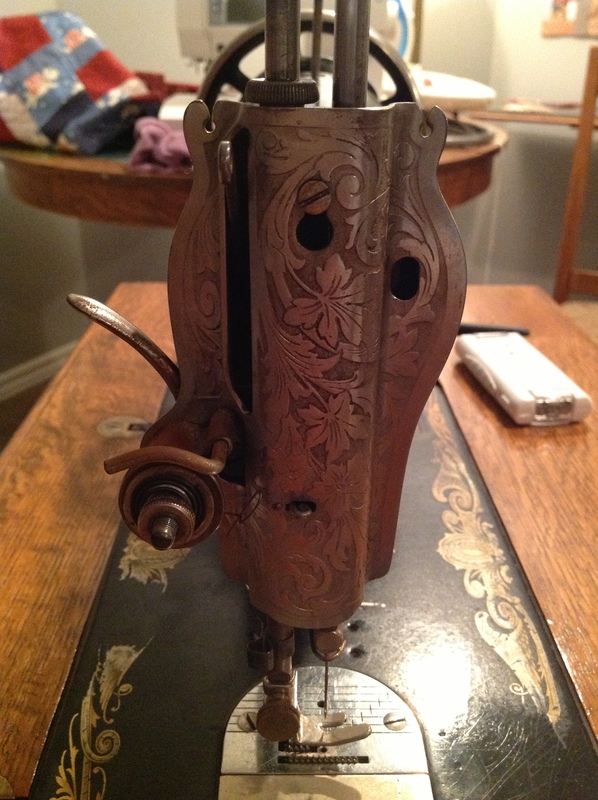 I joined a vintage sewing machine forum and got all my vintage machines working due to some very wonderful mentors. After being a member, I soon learned that this model is a must have. As the other 3 machines are cast iron and weight 40 lbs. This perfect portable is aluminum and in my blog header weighing in at 9 lbs. I went all out for this machine on ebay from a Canadian seller. Found out it was her gradmonthers which makes it more special in a way I can’t explain. Grandma bought it in 1948. Serial AH568635. The gloss and shine on this machine is wonderful and worth every dollar – I paid $200 for it. PFAFF 251-9. This machine was marked for the dump. The seller was giving it away because the thread always broke and her wheel didn’t turn very well. I picked her up on a door step on a snowy day. Frozen solid, I cleaned her up with a cloth. When she warmed up I oiled her and set the tension for 9 to 3! This special machine was made in West Germany and will be a workhorse. It is from the 1970s. TRADED THIS ONE FOR 4 BROKEN MACHINES – ONE BEING A SINGER 431G ROCKETEER! 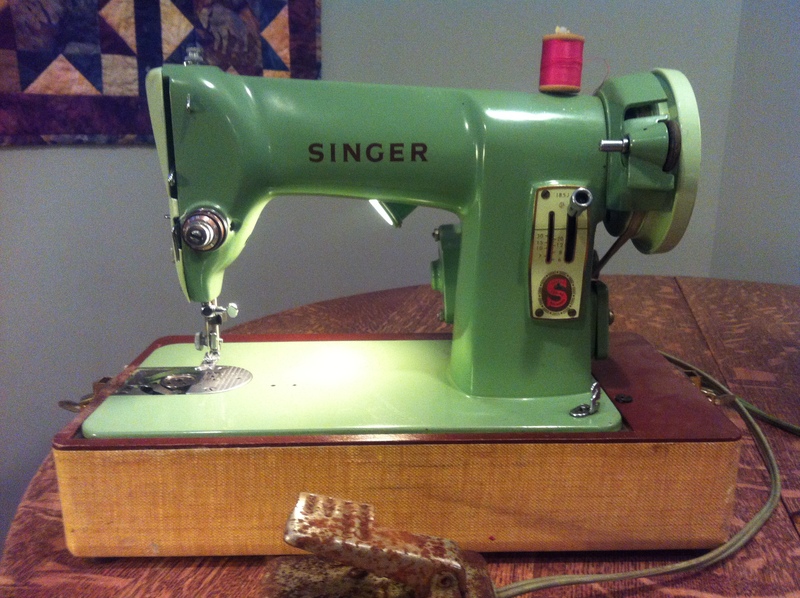 UPDATE Jan 8, 2012: SINGER 185J My little green machine!